Mac Lustre in Patisserie This is my favourite shade to wear on a daily basis. It's definitely a 'your lips but better' and slightly browner+glossier shade. If you're not a fan of a glossy lip then you can just pat this in to the lips to take away the shine. I'm not a big fan of lipgloss these days and find this the perfect alternative to a standard matte lipstick. Mac Matte in Lady Danger I love this colour so much. It's a celebrity favourite too, Alexa Chung has been spotted in it and Melanie Blatt regularly sports it on The X Factor. Why is it so great? This cherry red is incredibly flattering. It works well against both pale and tanned complexions. It's a vibrant colour but it isn't too full on. If you wanted to make this more coral then you could pair an orange lip pencil underneath, Mac do some great lip pencils. While this shade is matte I find it quite creamy and not as drying as other matte alternatives. YSL Rouge Volupte Shine in #8 This is another berry pink lipstick but it isn't as neon as Impassioned. As it is sheerer it isn't as pigmented as some of my other lipsticks and again I like this one for everyday wear. It doesn't require too many touchups either as it fades to a pretty stain as the day goes on. This shade would flatter a wide range of skintones. 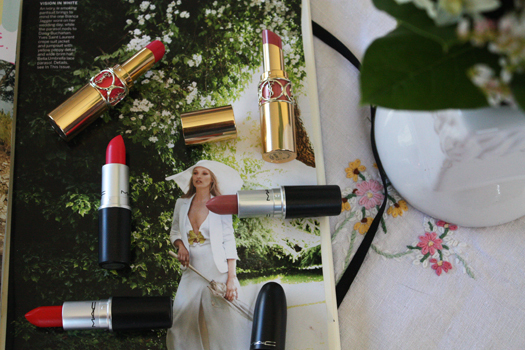 The Rouge Volupte shines are such versatile shades. What are your favourite lipsticks or lip products?